Based on data gathered between 1984 and 2008 from 187,382 participants, scientists have released a study that show whole fruit diet particularly blueberries, grapes, and apples lowers the risk of type 2 diabetes while fruit juice consumption increases the risk. The study shows that a daily diet one or more servings of fruit juice increases risk by as high as 21% while 2 servings of whole fruits per week lowers type 2 diabetes risk by 23%. Diabetes is a disease where the body has difficulty in controlling blood sugar (glucose) levels. Glucose is used as a source of energy by the cells and is transported there through the hormone, insulin. People with diabetes have problems with how insulin is handled by the body; either the cells reject it or that there is not enough insulin produced. Type 1 diabetes is when the immune system starts attacking insulin producing beta cells which prevents the body to manufacture insulin. Formerly known as Juvenile Diabetes, Type 1 diabetes is generally hereditary and manifests during childhood. Type 2 diabetes happens when the cells start rejecting the body's produced insulin or that the body does not produce enough insulin. Type 2 diabetes is the most common form of diabetes and can be associated with risk factors such as obesity, physical inactivity and also can be hereditary. "While fruits are recommended as a measure for diabetes prevention, previous studies have found mixed results for total fruit consumption. 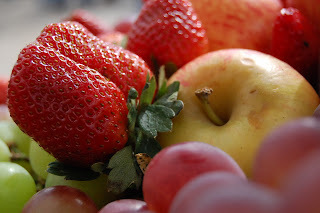 Our findings provide novel evidence suggesting that certain fruits may be especially beneficial for lowering diabetes risk," said senior author Qi Sun, assistant professor in the Department of Nutrition at HSPH and assistant professor at the Channing Division of Network Medicine, Brigham and Women's Hospital. The study appears online August 29, 2013 in BMJ (British Medical Journal). The researchers examined data gathered between 1984 and 2008 from 187,382 participants in three long-running studies (Nurses' Health Study, Nurses' Health Study II, and Health Professionals Follow-up Study). Participants who reported a diagnosis of diabetes, cardiovascular disease, or cancer at enrollment were excluded. Results showed that 12,198 participants (6.5%) developed diabetes during the study period. The researchers looked at overall fruit consumption, as well as consumption of individual fruits: grapes or raisins; peaches, plums, or apricots; prunes; bananas; cantaloupe; apples or pears; oranges; grapefruit; strawberries; and blueberries. They also looked at consumption of apple, orange, grapefruit, and "other" fruit juices. People who ate at least two servings each week of certain whole fruits — particularly blueberries, grapes, and apples — reduced their risk for type 2 diabetes by as much as 23% in comparison to those who ate less than one serving per month. Conversely, those who consumed one or more servings of fruit juice each day increased their risk of developing type 2 diabetes by as much as 21%. The researchers found that swapping three servings of juice per week for whole fruits would result in a 7% reduction in diabetes risk. The fruits' glycemic index (a measure of how rapidly carbohydrates in a food boost blood sugar) did not prove to be a significant factor in determining a fruit's association with type 2 diabetes risk. However, the high glycemic index of fruit juice — which passes through the digestive system more rapidly than fiber-rich fruit — may explain the positive link between juice consumption and increased diabetes risk. "Our data further endorse current recommendations on increasing whole fruits, but not fruit juice, as a measure for diabetes prevention," said lead author Isao Muraki, research fellow in the Department of Nutrition at HSPH. "And our novel findings may help refine this recommendation to facilitate diabetes prevention."